Professional assassin called an "eliminator". Doesn't crave latinum, but doesn't like being cheated. Brunt called him a psychopath during the 2374 Ishka rescue. Once per game, may kill any one personnel present. 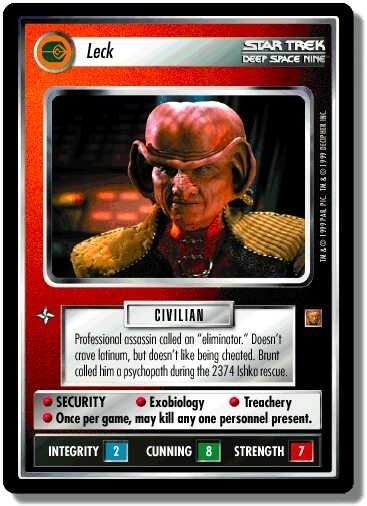 Characteristics: "Reshape the Quadrant"-related cards, affiliation, Assassin, Ferengi species. There are 26 entries for Leck (ST1E 8 R+ 84) at the Tradeplace (21 haves and 16 wants). Click here to see all trade list entries for this Rare Plus card!